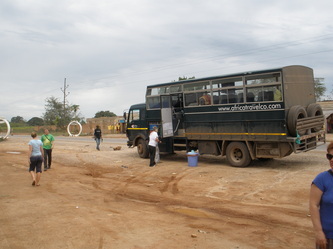 I first did an overland truck trip in Africa four years and enjoyed the experience, so on my recent trip to East Africa I decided to do another one, mainly for convenience and safety concerns but also because on a truck you get a group of readymade friends to share the journey with you. I decided to go with the devil I knew, so booked again with Africa Travel Company (ATC) who are based in Nairobi. 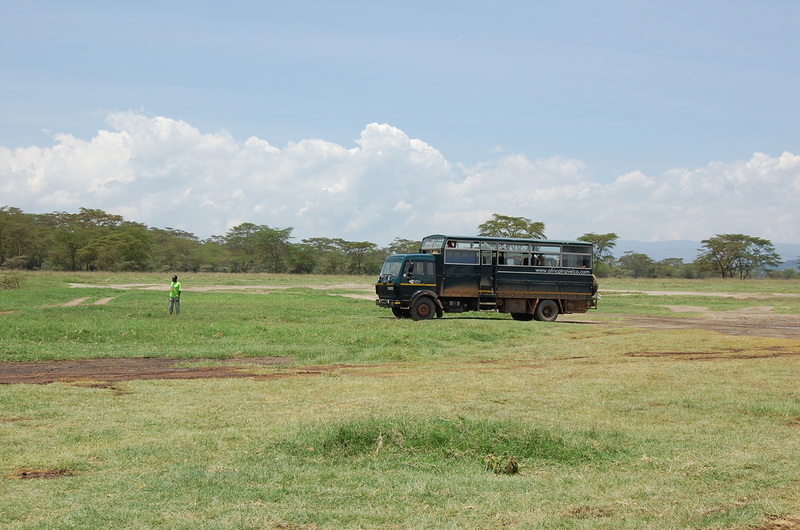 On this trip I actually went on two trucks, the first one had come up from Cape Town, I got on at Dar es Salam and went on it up to the North Tanzanian game parks then onto Nairobi. There I got on a truck with a new group and leader that went to the Masai Mara national park, then into Uganda, driving down to the far south of country to see the mountain gorillas over the border in The Congo. This leg was the start of the groups 52 day trip that ended in Cape Town. I got off the truck when it arrived back in Nairobi, and all together I spent three weeks – trucking. One thing that is immediately apparent is that nothing has changed in the four years since I last travelled with ATC. 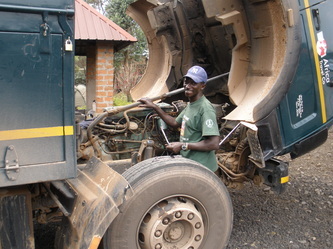 The organisation of the truck, rotas, the daily routine and all the equipment is exactly the same. Even the pre departure information sheets don’t seem to have been amended. At the end of each trip passengers are asked to fill in assessment sheets (I filled in two this time round) with their thoughts on their experience and how things could be improved and no doubt ATC has collected thousands over the years; what happens to them all? No doubt someone must have made a few good suggestions, but nothing that has ever been actioned. Anyone reading my original article ‘Africa by Overland Truck’ will still get a pretty accurate picture of daily truck life. Of course, different companies do things in different ways, I saw one truck that had individual lock up boxes for passengers to put their valuables, ATC’s safe was communal; and in one truck park, a ‘Rolling Hotel’ a monster German truck which has individual sleeping compartments as well as seating, so the passengers live entirely on the truck. 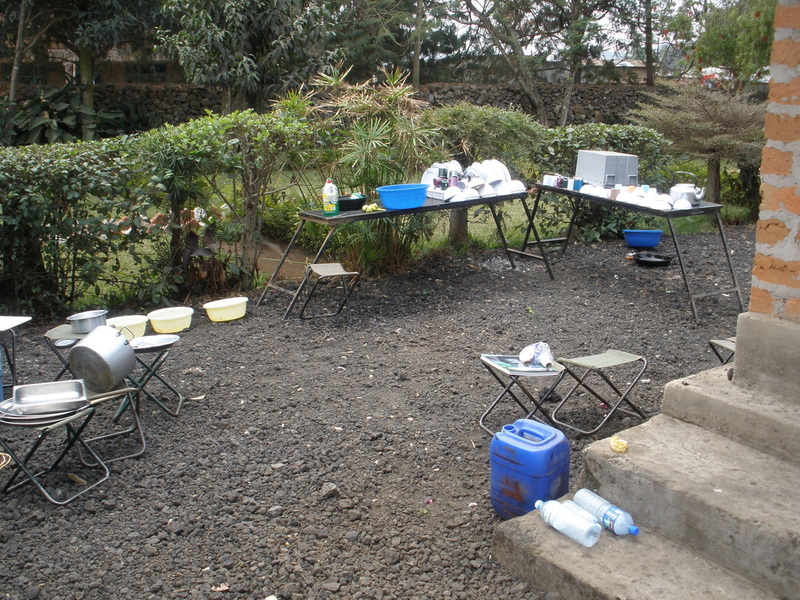 They also ate their meals off tables, overlanding luxury! 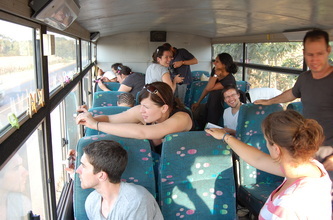 One factor to be considered when booking an overland trip is how many crew it has. ATC always have a tour leader, a driver and a cook. If there are only two crew, it means that the passengers have to do the cooking which can lead to variable results and extra work for all concerned, something you may not want if you are on holiday. As before, some passengers had unrealistic expectations of what to expect on an overlanding trip, usually because the agent who had sold the package hadn’t given them full information. One girl was aghast that there were no tables at meal time and that plates have to be balanced on your knees. 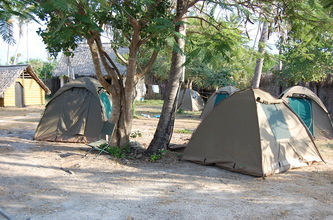 Another thought that the tents were put up every night by the crew or the people at the campsites, they never considered that they would have to do the job themselves. Lots of people complained about the dust, but that's Africa, it's either dust or mud. I much perfer the dust. There were some long driving days on the trips I did, it was very apparent that the itineraries are all based around ‘activities’. 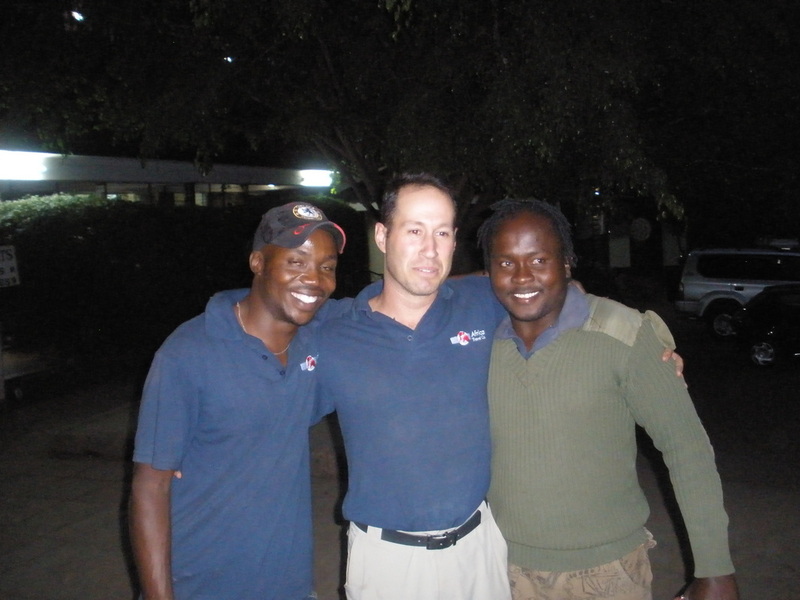 For example the leg from Kenya into Uganda, stopped in Kampala for the night (all we saw of it was a shopping mall) and the next day we drove the length of the country to the far south west so that we could go Gorilla trekking in The Congo. We had a day at Lake Bunyonyi (very nice) a day trip into Rwanda (organised by the tour leader) then had another fourteen hour driving day all the way to Jinja, where the group could do adventure activities like white water rafting. Most of the country of Uganda was just passing scenery out of the window, mainly because, no matter how nice or interesting a place may be, everything is judged on what ‘adventurous activities’ can be done there. I looked around the town of Jinja, which had some pleasant cafes and the site of the source of the Nile which I wanted to see. No one else on the truck bothered, and the tour leader never suggested going into town; the other passengers not rafting just hung around the campsite all day. The same in Eastern Kenya, we passed some lovely countryside with lots of tea plantations, but I don’t suppose anyone’s considered it might be interesting to visit one? Instead endless driving, as we had to reach a particular campsite as soon as possible. These long days in the truck do become quite wearing and when I met up with my first group in Dar, they were exhausted by it. The leg from Victoria Falls to Dar is one I’ve never done on a truck for good reason, as there are very few places to do activities this means lots of long driving days. Zambia is basically two days driving and nothing else. There are a few stops in Malawi, as there are things to do there, like at Kandi Beach; but after that a couple of long days on the road to get to Dar. Everyone loved Zanzibar as it was like a holiday away from the truck and the routine of getting up and eating breakfast in the dark, driving all day, then putting up your tent and eating dinner in the dark. On my first truck we didn’t even stop for lunch, only toilet breaks, we had to make sandwiches and eat them as we went along. Most people could easily have done with a week in Zanzibar but we only stayed three nights. 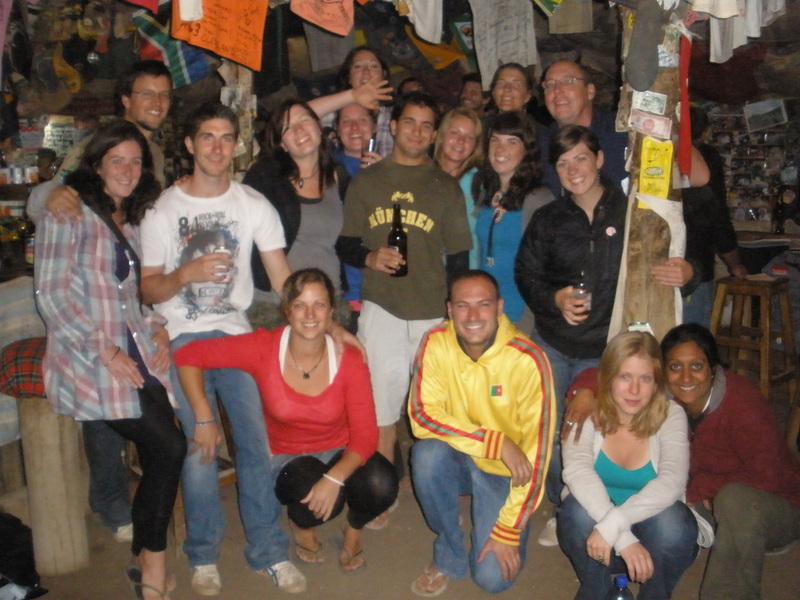 The one factor you cannot control on an overlanding trip is who your travel companions and crew are. Luckily on both my trucks I met some interesting people and we all got along very well. Australian travel agents seem to push ATC tours so there were a lot of Australians on both the trucks I was on. I also hopped a short ride with another ATC truck at the end of my trip where nearly all the passengers were Australian! The two tour leaders I travelled with were completely different in the way they approached the trip and dealt with people. On the first truck from Dar to Nairobi, the leader was a young American guy who was totally in love with Africa and who conveyed his enthusiasm at all times; he was also an outstanding naturalist. He saw himself as a guide, and he gave a running commentary not only the wildlife but also the landscape, people and everything else we could see out of the window. He had a very hands off approach to running the truck, the chores rota existed and he left us to get on with it, he didn’t feel the need to oversee everything. The same with getting room upgrades and border crossings, we were left to sort it out ourselves, and nobody thought that there was a problem with this. On the second truck the leader was a young English woman who set the tone at the beginning at the start by stating that she was ‘a tour leader and not a guide’ and also ‘that the next two weeks will be some of the worst of your life!’ Luckily I’d had some experience so wasn’t too bothered by that, but I did feel sorry for one Australian man as the trip was his annual two week holiday so not a big moral boost for him. In the past she’d had a lot of young people on her truck, so she was very hands on, constantly making sure things were done. This was an approach that did not work so well with an older more mature group, as it came across as endless nagging and moaning. Although a jobs rota was set up, the leader did not like to see people standing around doing anything, so she began to press people into helping with chores. After a few days the system began to collapse, as the attitude developed of ‘everyone’s doing it, so nobody’s doing it’ and the people who were supposed to be doing a certain job stayed away, safe in the knowledge that a few stalwarts and whoever had been press ganged were doing the work. Not surprisingly this led to a lot of resentment and even more yelling and moaning from the tour leader. On the other trucks I’d been on, the jobs rota worked because it was fair, the jobs were shared out and everyone had a day off; and everyone was mature enough to realize that doing some work was part of the deal. Micro management by the tour leader managed to wreck it fairly quickly. In the end I was glad to get off, just to get some peace and quiet. 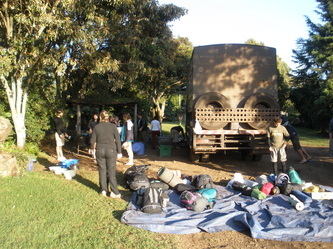 After I left the truck at Nairobi I travelled alone, back down to Zanzibar and onto Malawi. 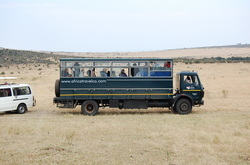 I’d originally joined an overlanding tour as it was convenient, particularly with arrangements for safaris in the main game parks, and for safety concerns. Of course I had a few white knuckle bus journeys and the ATC trucks hadn’t been driven very fast, hence the endless hours on the road. What was a concern though is that a driver who has been at the wheel for fourteen hours, sometimes day after day, is a driver who may very well make an error. I saw innumerable truck and bus wrecks at the side of the roads, many probably made by tired drivers. Another reason the trucks went so slowly was that they weren’t in great condition. On my second trip we nicknamed the truck the ‘tortoise’ as it could only crawl up hills, and on one occasion we had to stop for emergency repairs. These things happen but you don’t expect to set off on a road trip with a vehicle that starts out with problems. Would I do another trip? Probably not. I’ve overcome my reticence about travelling on African public transport and if I went to the region again I feel I could get around fine on my own. Certainly a tour that involves getting up well before dawn for days on end and endless driving, just so that some people can do activities doesn’t have much appeal. These trips offer companionship which is great but they don’t add much else in the way of added value, they get you from A to B, feed you and arrange trips and that’s about it. The only way I would sign up with another ATC tour is if the young American tour leader was leading it. He really added value; unfortunately he seemed to be very much the exception.